Nortel Norstar T-Series phones, also now known as 7000 series digital telephones were originally released as the "Business Series Terminals" or BST line. These phones are a feature-rich portfolio with enhanced capabilities that provide telephony solutions for a broad landscape of users, from Business Communications Manager or BCM users, to Avaya IP Office with Nortel Norstar digital cards, to high-volume call positions and executives, to low-intensive users and small workgroups. 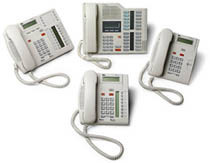 While these Nortel Norstar phones T7000 telephones boast the industry leadership and strengths of the Norstar telephone portfolio, the new portfolio also delivers new value-added features like tilt display, visual ring indicator, message waiting indication (MWI)*, newer design aesthetics, a streamlined footprint, new labeling strategy, an audio control center with a headset button and more. 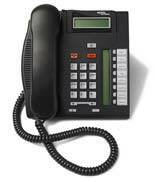 All Nortel Norstar phones come with a one (1) year warranty. Desktop Assistant Button Labeling Application - A software application tool has been developed to support the button labeling strategy. The Desktop Assistant tool, supports users in quickly and easily labeling their T7100, T7208 and T7316 telephone sets. This application is for end-users to create customized labels for their sets. The application can be purchased on CD from your authorized Nortel Networks distributor, or the application can be downloaded from the Web free of charge. If you have already purchased a Business Series Terminal, buy the Desktop Assistant for your computer. The Nortel Norstar / Avaya 7000 Series Phone portfolio sets a high industry standard with its feature rich sets and user-friendly interface offering a full range of features that can significantly enhance day-to-day productivity. New Streamlined Aesthetics: a smaller set footprint provides end-users with additional space for other desktop tools in their work environments. New 2 color scheme, Charcoal and Platinum: Updated look and color scheme gives fresh vitality to the portfolio. New Strip Labeling Strategy: offers a simplified strategy for labeling the programmable buttons on each set. With the benefits amounting to reduced time and costs associated with Moves and Changes at the desktop level. Fully Adjustable Tilt LCD: : The tilt display provides for clearer viewing of information or message prompts on the Liquid Crystal display in different Lighting environments. Visual Ringing Lamp / Message Waiting Indication (T7100, T7208, T7316): Informs you while you are on another call or away from your desk that your phone is ringing. Audio Control Center with Headset and Mute T7208, & T7316: Alongside the Hands-free button the audio control center provides you with the ability to quickly change and control the volume and path of your call. Large Dial pad: Larger keys on the dial-pad provide a more user-friendly interface and enhances productivity. Built-In Speaker: For hands-free conversation, background music, group listening, and paging announcements. This high-quality speaker saves your neck and ear during long calls without distorting the conversation. Feature Button: Use this button to program or use Norstar or Business Communications Manager features. Hold Button: Put a caller on hold with the touch of a button. Tones or music on hold assures callers they have not been disconnected. Release Button: You don't have to lift and replace the handsets to hang up after a hands-free call. Just press the release button. Volume Control Bar: Easily and quickly adjust the ringer, handset, headset, or speaker volume whenever you need to. Memory Buttons: No more searching the Rolodex or Personal Hand Held Devices for a customer's phone number. Program the numbers you frequently use on these buttons for one-touch dialing. Or program memory buttons for quick access to system features or network services. The choice is yours - customize your phone for the way you work. Display Button (Soft Keys): To make communications even easier the Business Series Terminals T7316 and the M7324 attendant position set provide 3 softkeys integrated with the LCD Window. While the Window tells you your status and options, the softkeys let you select an appropriate action with one touch. No commands to remember. Just make your choice and press the softkey. Programmable Buttons: Each phone is easily customized to fit the individual user's needs. Buttons can be programmed as lines, intercoms, autodial numbers, or features. If you frequently meet with customers in your office, program a button for "Do Not Disturb," and eliminate telephone interruptions with one touch. Or for quick dialing, program the numbers you frequently call on these buttons. Intercom: You don't want to tie up an outside line just to call someone down the hall. Using the intercom keys leaves lines free, so your customers can reach you. 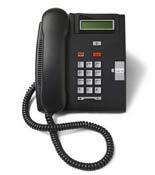 Hands-free: With one-touch hands-free operation, you can place or answer calls without picking up the handset. Mute Button: You can use the mute button to listen without being heard. * In order to activate Message Waiting Indication (MWI), you must have the following system software installed: Norstar MICS/CICS 4.1.1 system software or Business Communications Manager Release 2.5.